November | 2014 | JUDDER! Good day, Juddering boys and girls! I’ll be honest, I’m still at a loss for words after our JUDDER HALLOWEEN SPECTACULAR – this event is always the highlight of the Judder calendar, and we know you all like to make a special effort, but nothing could have prepared us for what happened… we were inundated with hundreds of mayhem-hungry trick or treaters from the moment we opened the door, almost all of whom were in fabulous costumes and were ready to party hard! And party they did – I have never seen the dancefloors so full of smiling faces and the courtyard to be quite so buzzing with revellers. The cherry on the top was a banging set from guest DJ Geoff Echo, who I got to go back-to-back with for 90 minutes at the end of the evening for some true dancefloor carnage! We were so busy on the night that we have yet to judge the competition for the best fancy dress and this is where we need your help – please send us your photos of the night via the Judder Facebook and tag all your friends – before our next Judder we will be giving away some fabulous prizes including a years’ free entry to Judder! And if you let us share your photos on the Judder site, you can get in free next time too! Official photos will be coming soon and we can’t wait to re-live the mayhem! Our next Judder will be the last one of 2015, but we are hoping to make it a date to remember – it’s JUDDER’S DISCO CHRISTMAS with special guests Dan & Vicky from Birmingham’s TRON and Dystopia club nights! We will be dishing out festive gifts to naughty *and* nice girLs and boys, and blinging up for Christmas with full festive decor & extra sparkles! 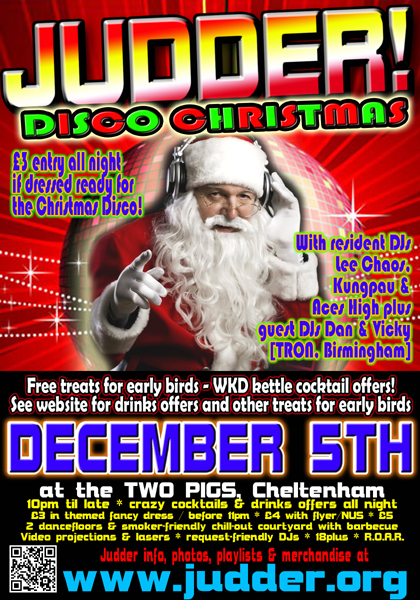 Entry is just £3 all night if you are dressed ready for the disco, so dust off those party hats, attach tinsel to your extremities and have one last festive blow-out before the relatives start making their demands! Join our Facebook event here! And if you’re looking for something similarly sparkly to bridge the gap left by us not having a Judder in November, I recommend Glitterati in London which is happening this Saturday – have a look at their Facebook event for more info. We are also just about to sort our dates for 2015 and have some ideas for themes, but we are always keen to hear suggestions for new ideas or to bring back popular themes for another run – drop us a line with your ideas and if we choose one we will let you in for free on that night as a thank-you! Right, I’m off to deck the halls and figgy the puddings – see you in December!